A pyrethrum-based formula that is applied directly on the animal. This ready-to-use product provides fly protection and imparts a high shine to the hair when brushed out. A favorite of show horse owners, effective protection results from only 2 ounces per head. 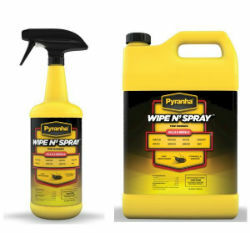 Wipe N' Spray is citronella scented and contains lanolin as a coat conditioner. Kills and repels flies, mosquitoes and gnats. Features: Triple Action - Kills, Repels and Conditions, Contains lanolin as a coat conditioner, and Pleasant citronella scent.